I am writing after a long gap seriously. This post is post the GRE and PG mishaps. So what I am going to write? Actually I am not sure how to answer this question. The BBC Tv series Sherlock which lingered in my mind for a very long time. I thought about writing it for a long time. I can understand that you may think that I am always starting of all the posts like this. The reason is I am a laziest of the laziest person, who wishes to write a novel and don’t even try to type a word. Let’s go back to the post. The series impressed me too deep as usual. I wish to share a few things I noted about the characters in the series and how well they are crafted. Sherlock Holmes is a consulting detective and he meets a doctor who becomes his assistant Dr. Watson and they both help Detective Inspector Lestrade to solve the case. This is the story and I am sure you all know it right from 1930’s. I feel ashamed to confess that I haven’t completed the Legacy of Sir Arthur Conan Doyle yet. I have seen few movies of Basil Rathbone and whenever I read a holmes story Rathbone’s face comes to my mind and few years before it changed to RDJ. Of course after watching the Guy Ritchie flick you can’t bring anything else in mind. Now Benedict Cumberbatch stole the place by force, even with me having a soft corner for RDJ in my mind. So what is exactly in the series, why am in so exaggerating? When talking about Sherlock holmes, the first thing comes into mind is Pipe, 221B and Deerstalker. Pipe turned into nicotine patches and diary of Dr. Watson turned into Blog(heyy!!! He tooo a Blogggerrrr) and with blackberries, iPhones, Laptops, even listening this makes one exciting especially for a fan who expecting a subtle Sherlock adaptation. 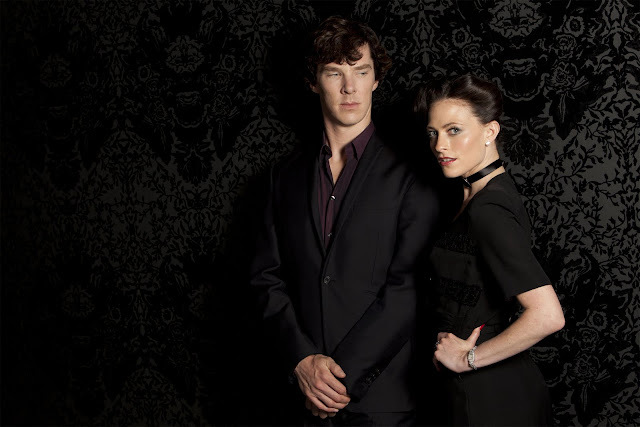 They roles are crafted perfectly, the Sherlock’s arrogance and the fear of other people to near him, and of all the humour and background score made me watch again and again. The whole series is not about just modernizing the series of stories but rather the tribute to the Cult(no! no! not Mysskin kinda tribute). Then casting is another big role, I never ever noticed Martin Freeman in any of the films before I watching Sherlock although I saw few of his movies. Jude law vanished from my mind a long ago and it is perfectly filled by Freeman and I doubt if anyone else can fill the spot. Then comes the Cumberbatch guy as Sherlock, the script is too awesome and the portrayal of London is a treat to the eyes. You will see the modern adaptation more convincing and more truth to the original rather than a namesake usage. 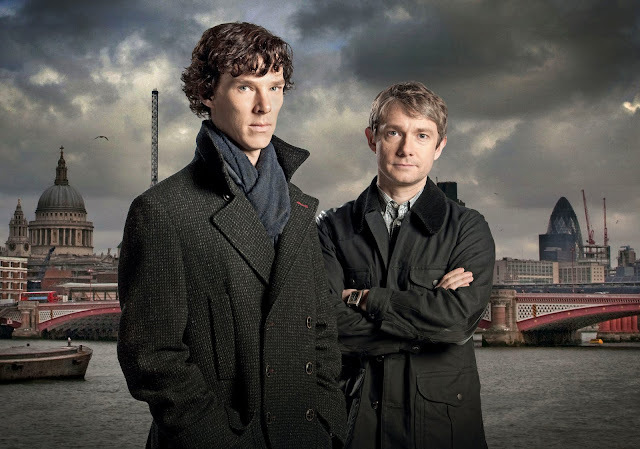 It is evident that the creators are sherlocked!!!!!!! And so do I !!!!! I have been cumberbatched and sherlocked from day one... words can't express how much I love this stunning BBC adaptation of this classic book. The creators have got every detail right, Benedict has nailed the role, and the others do their part equally well. The best show on this planet... I have written bout it too on my blog. The next season will be released by jan 2013 it seems. Waitings eagerly wor it. This series has re-invented Sherlock Holmes in a new avatar. Simply mesmerizing.